Basically, an improvement of 33 times the speed of using a normal pc..
It’s a BANG! – A big one, which many are calling the new industrial revolution – AI. There, many companies listened, adopting this technology: Baidu, Google, Facebook, Microsoft adopted this for pattern recognition and soon for more..
Later on 2012, Alex Krizhevsky from the University of Toronto won the 2012 ImageNet computer image recognition competition, by a HUGE margin, beating image recognition experts. He did NOT write computer vision code. Instead, using Deep Learning, his computer learned to recognice images by itself, they named their neural network AlexNet and trained it with a million example images. This AI bested the best human-coded software. Later on, by 2015, Microsoft and Google beat the best human score in the ImageNet challenge. This means that a DNN (Deep Neural Network) was developed that bested human-level accuracy. 2012 – Deep Learning beats human coded software. 2015 – Deep Learning achieves beats human level accuracy. Basically acquiring “superhuman” levels of perception. Related to this, I wanted to highlight the milestone achieved by Microsoft’s research team on 2016 but before this, let me mention what Microsoft’s chief scientist of speech, Xuedong Huang said on December 2015: “In the next four to five years, computers will be as good as humans” at recognizing the words that come of your mouth. Well, on October 2016, Microsoft announced a system that can transcribe the contents of a phone call with the same or fewer errors than actual human professionals trained in transcription… Again human perception has been beaten..
Also, similarly, we have the Quadro family, focused on professional graphic workstations, for professional use. Being their flagship the Quadro P6000 with 3840 CUDA cores 12 Teraflops and 24GB GDDR5X. I believe these AI processors are two the newest Xavier system-on-a-chip processors coupled with an embedded GPU based on the NVIDIA Volta architecture. The other two seem to be two next generation discrete GPU with hardware explicitly created for accelerated Deep Learning and computer vision algorithms. All in the size of a license plate.. not bad! This is huge – again yeah. Think that this is basically putting 100 high-end servers in the size of a license plate.. Servers on current Hardware, that is.. This is nvidia’s GPU Architecture which is meant to bring industrialization to AI, and has a wide range of their products supporting this platform. NVIDIA Volta is meant for healthcare, financial, big data & gaming.. This hardware architecture consist of 640 Tensor cores which deliver over 100 Teraflops per second, 5x the previous generation of nvidia’s architecture (Pascal). DGX systems – AI Supercomputers “a la carte” Based on the just mentioned Volta architecture, having 4x TESLA V100 or the Rack based supercomputer DGX-1 with up to 8 TESLA V100, having each an intel Xeon for each 4 V100. Oh, and all the other hardware boosted to support these massive digital brainpower.. Smaller than the 100x servers it can beat, right? V100 family, along Volta Architecture, were presented just recently this year at Computex, end of May. They are also empowering IOT solutions for embedded systems, targeting small devices like drones, robots, etc.. to perform video analytics and autonomous AI, which is started becoming a trend now in consumer products..
As you can see the race is on, and continues to accelerate and who knows where it will bring us to.. Please respond directly on my blog so I do not have to work on recopilating the information from different sources..
Yay! It feels good to C-H-E-C-K !!! 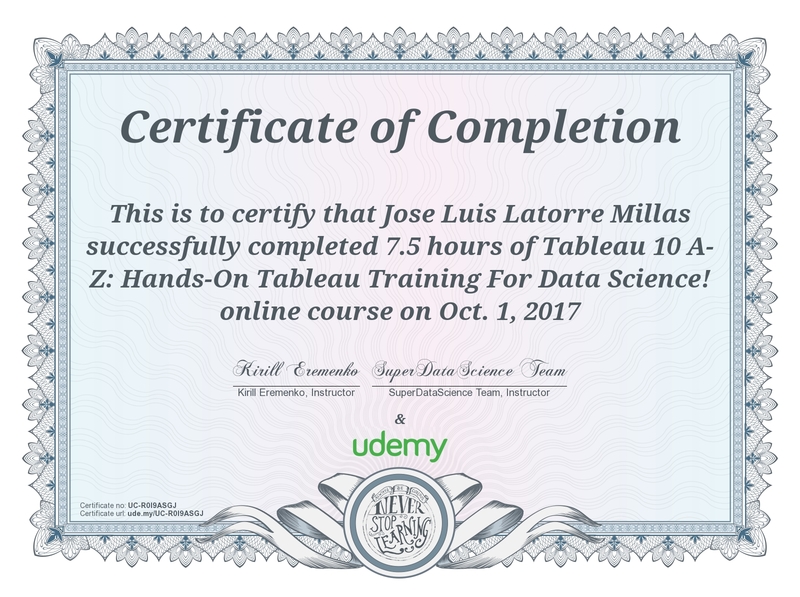 A couple of days ago I finished my Tableau “Basic to Intermediate” course on udemy, “Tableau 10 A-Z: Hands-On Tableau Training for Data Science“. And yeah, it’s a bit more than a couple of days ago but… I am really happy! Some days ago, a bit before I finished the Tableau course, I took one day off to go to my company (RDI – Roche Diagnostics International) internal BI conference, as I “officially” do not work on BI nor Data Science, I had to if I wanted to attend… I attended only the Data Visualization day, focused on… what else but Tableau! So, it makes sense to invest some time in Tableau, doesn’t? Being an expert on usability, user interface design and UX (User eXperience) design & development, which I worked for years… I can say I am having lots of fun with this tool. To showcase that I was one of the first to raise the hand when the speaker(s) asked if somebody had already finished the exercises, repeatedly being on the initial group of early finishers, from 3 to 7 in a room of around 80 Tableau practitioners… I can’t say anything but that I am extremely happy and satisfied with this course!!!! To add on, I did not only perform the exercises, but understood them inside-out and tried to apply the techniques to other scenarios, more tailored to my work or needs, playing around. That helped greatly. I greatly recommend to you all this course and I have purchased the other two courses from Kirill dedicated to Tableau, “Tableau 10 Advanced Training” and “Tableau Expert: Top Visualization Techniques“. I will probably perform them when I have some more experience and my recently acquired knowledge is laying on more solid ground – but definitely they are on my checklist! Hope it was interesting and I do recommend you take a peek at Tableau.